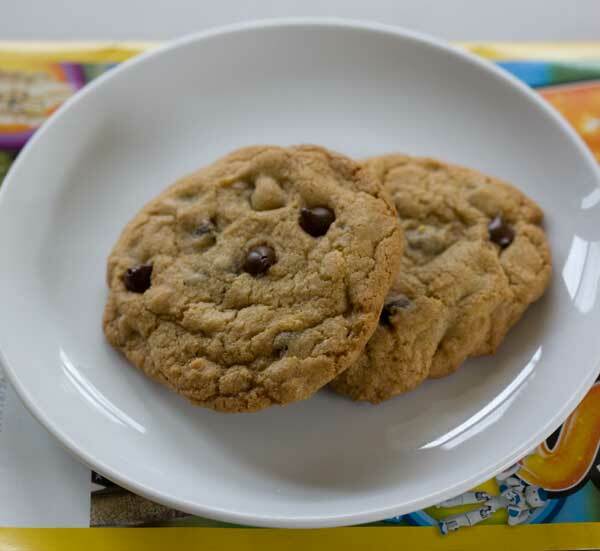 This recipe for chewy chocolate chip cookies is one of my all-time favorites. While the cookies aren’t as thick as The New York Times recipe, this recipe gives you a slightly sweeter and chewier cookie. 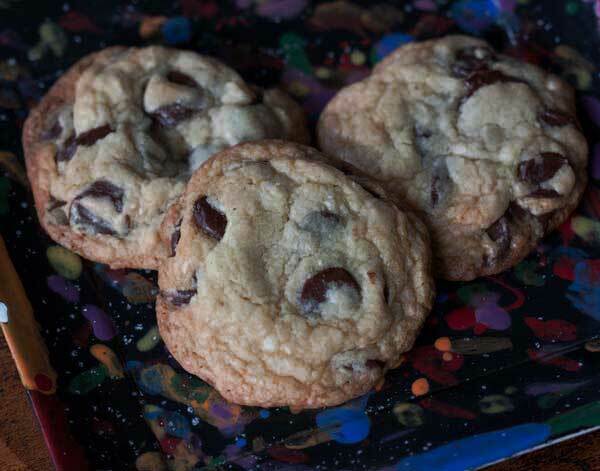 Adapted from an old chocolate chip cookie recipe in Gourmet, these cookies are large, slightly flat, and have chewy centers and crispy edges. Chilling the dough gives you a slightly thicker cookie, but you may also bake the cookies right away. If baked right away, the cookies will be much thinner. Because I make these so frequently, I’ve learned a few things and have put a lot of notes in the recipe itself. Email me if you have any questions. It’s always interesting to read the reviews on the original Gourmet recipes because some people think the cookies are awful and others say they are the best cookies ever. I’m in the latter group, obviously! Update: Since I keep promoting this recipe, here’s another tip. You may bake these at 350 or 375. 350 will give you a slightly more even texture, while 375 will give you really crispy edges and an even chewier center. But baking at 375 is a little trickier because the edges bake a lot faster. When I bake at 375, I pull the cookies out when the middles are still kind of pale. In addition, the cookies may spread, so as soon as I pull the pan from the oven I use the tip of a spatula to gently shove the edges inward. As the cooks cool, they firm up with lots of ridges and folds. Also, the middle actually browns a little as it cools. If you realize that you’ve pulled the cookies out too early and the edges seem brown but the centers still seem underbaked even as the cookies cool, don’t worry. Just let the cookies cool completely and put them in the freezer for a bit. They’ll have a chewy underbaked center, but they’ll still taste good. Giant, chewy, chocolate chip cookies. I apologize for all the notes, but I've made these so many times and have lots to say! Beat together butter and both sugars in a large bowl with an electric mixer at high speed for 1-2 minutes. The mixture will become pale and a bit lighter. Add egg to butter mixture, beating with mixer until creamy, about 1 minute. Beat in vanilla, baking soda and salt. By hand, stir in flour until just blended; stir in chocolate chips. Using a generously heaping tablespoon measure, scoop up 14 mounds of dough and arrange on a foil lined plate. Chill until firm. Preheat oven to 350 degrees F or for crisper edges and softer centers, 375F. Have ready two ungreased or foil lined cookie sheets. You can line them with parchment if you want, but they the cookies will spread less if you use regular foil or just leave the cookie sheets ungreased. Arrange dough mounds about 2 ½ inches apart on cookie sheets (7 to a sheet). Press down centers just slightly. Bake 1 sheet at a time on center rack for about 12-15 minutes or until edges are browned. If the cookies spread while baking, use the back side of the tip of a spatula and gently push the edges inward. Let cookies cool on cookie sheet for about 3 minutes, then transfer cookies to a rack to cool completely. **The amount of egg is strange, but the end result is worth it. You could probably get away with using a jumbo size egg, but I typically have large or extra large eggs so I use an egg and an extra tablespoon. 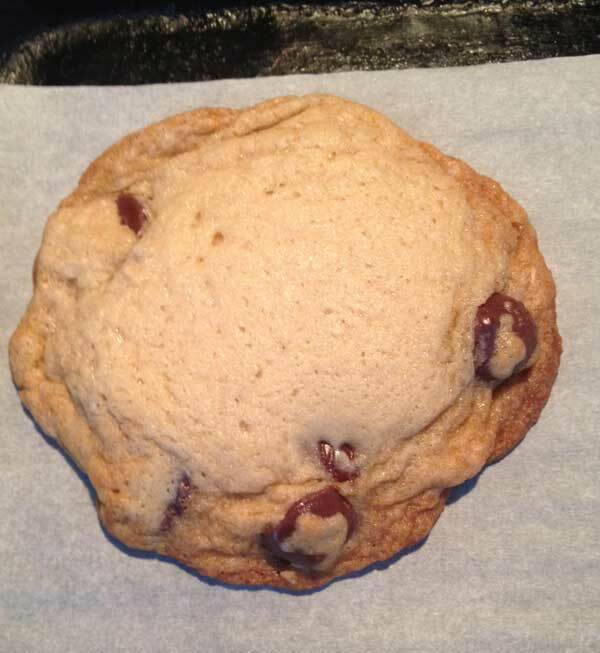 **Cookies made with chilled dough have a slightly better texture and bake up thicker. I like to bake a few right away, then keep the rest of the dough mounds in a heavy duty zipper bag in the refrigerator or freezer to be baked as needed. You'll probably have to increase the baking time if you are baking cookies that are chilled through and through. **For crisper edges, bake the cookies at 375 F. and adjust the baking time. A higher temp should give you paler centers and darker edges. If you bake at 375 the cookies will have very brown edges and pale centers. Pull the cookies out even if the middles look a little underbaked. They will bake internally as they cool. **If you add the sugar to the butter while it is still hot, the hot butter may melt the sugar and you may get shiny cookies (this has happened to me on occasion). If you do add the sugar to the butter while it's hot, the dough will probably require some more chilling. ** The amount of chocolate chips seems really high, but if you like chocolate you should be happy with the results. Even though the dough seems packed with chips, the cookies spread in the oven and the ratio of chips to dough seems pretty reasonable. Also, since these cookies are sweet, I use extra dark (Guittard) chips to offset the sweetness a little. Toasted nuts are always a good addition, too. **If you use chunks of chocolate rather than chips, be sure to chill the dough. Sometimes chunks of chocolate, depending on the brand, cause the cookies to spread more. **Using European style butter such as Plugra make the cookies slightly thicker and denser. I can’t remember if I’ve made these! I will have to make them soon and refresh my memory.